With one application, gain visibility from over 100 accelerators. Apply to join a GAN Accelerator today. 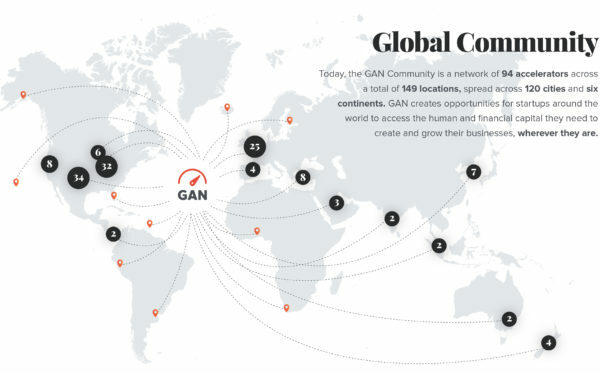 The GAN Common Application provides startups with the opportunity to be seen by over 100 of the world’s top accelerators. The process of applying is easy: simply follow this link to complete the application and submit. From there, we will pass your information on to the GAN community of accelerators. Accelerators who wish to connect with a startup can request to do so. Once an introduction has been made, an accelerator may ask startups to fill out a program specific application in addition to the form you have completed here. While our goal is to make the process as seamless as possible, sometimes multiple applications are unavoidable. For this reason, we recommend that you save your responses for this form to be used on future accelerator applications! Please note: Introductions will be made at the request of GAN Accelerators, but If you wish to contact an accelerator we recommend you reach out to them directly – you can find all GAN accelerators and access their websites in the GAN Accelerators Directory. The GAN Common Application provides startups with the opportunity to be seen by over 100 of the world’s top accelerators. The process of applying is easy, and should take less than 10 minutes. Applying is as easy as following this link and filling out the form! GAN Accelerators are always for looking new startups to fill their programs. They’re looking for the best and brightest in the world, so make sure your application is strong to catch their eyes! If you do catch some eyes, the interested accelerator(s) will reach out to you directly. After making a connection (and hopefully an impression) with a GAN Accelerator, you may be invited to their upcoming cohort or asked to fill out a special application for their cohort.